Electric passenger drones, seating two to five travelers and looking like distant cousins of today's helicopters, could come on the market within the next two years, according to a new study by Deloitte. 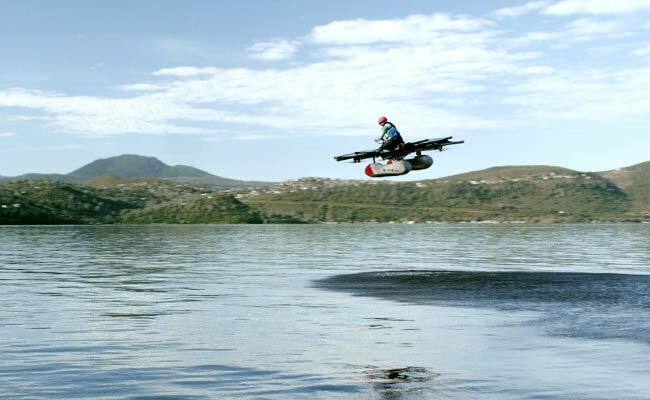 Washington: The dream of flying cars has been around longer than Boeing Co. has been making airplanes. Now a vision from the pages of Jules Verne is near enough to occupy the present-day plans of Boeing's leadership. "I think it will happen faster than any of us understand," CEO Dennis Muilenburg said in an interview. "Real prototype vehicles are being built right now. So the technology is very doable." The new era of flying urban vehicles is close enough for the man overseeing jetliners and spacecraft to begin plotting what he calls the "rules of the road" for three-dimensional highways. Autonomous air taxis and parcel-hauling drones have the potential to be the next disruption to sweep the aerospace industry, with Boeing and arch-rival Airbus SE among the manufacturers racing to stake a claim. Muilenburg sees it as a a rare opening to shape a new transportation ecosystem. Fleets of self-piloted craft could be hovering above city streets and dodging skyscrapers within a decade, he said. Propelling these advances are a flood of investment, rapid gains in autonomy, and growing consumer frustration with bumper-to-bumper traffic.Other observers share his aggressive timeline. Electric passenger drones, seating two to five travelers and looking like distant cousins of today's helicopters, could come on the market within the next two years, according to a new study by Deloitte. By the early 2020s, the study said, flying cars could drive to the airport by roadways and then accelerate down runways into the sky. Even NASA is now studying the feasibility of what the government space agency calls "Urban Air Mobility." But if any of these technologies are to take root, regulators must first figure out a host of critical safety issues, starting with how to manage both conventional traffic and new flying machines. "It won't be all turned on in one day," Muilenburg said. Boeing bolstered its portfolio of unconventional pilotless aircraft last year by buying Aurora Flight Sciences, whose projects include a new flying taxi it is developing with Uber Technologies Inc. Other partners for Uber's futuristic Elevate service include Textron's Bell Helicopter and Embraer SA, a Brazilian planemaker currently in tie-up talks with Boeing. Aurora has been inventing autonomous vehicles since the late 1980s, and its portfolio of novel flying machines includes a two-seat robotic copter known as an eVTOL (an abbreviation for electric vertical take-off and landing). For its rideshare of the not-too-distant future, Aurora plans to whisk passengers between rooftop "vertiports." Test flights could begin as soon as 2020 in Dallas and Dubai, according to the company.Others are also rushing rotorcraft concepts to market. Vahana, the self-piloting air taxi developed by A3, Airbus's tech-centric Silicon Valley outpost, completed its first test flight on Jan. 31. Intel and EHang are also testing their flying vehicles. But the next generation of Uber and Lyft Inc. vehicles can't arrive by air until manufacturers and regulators figure out how to keep them from bumping into buildings, commercial planes, personal drones and each other. That requires leaps in artificial intelligence and sensor technology from today's personal drones, which mostly fly within sight of operators. "Right now, what we're transitioning from is a hobbyist industry to a commercial industry," said Darryl Jenkins, an aerospace consultant specializing in autonomous vehicles.Jenkins think drones will first be adopted to haul packages, like the three billion pizzas delivered annually in the U.S. Flying humans is far more complicated, and a host of issues still needs to be resolved. Without human pilots or air crew, who would ensure passengers are protected from the uncovered rotor blades that would power most air taxi designs? Commuters aren't going to embrace flying craft unless their safety is assured, but getting approval from aviation regulators for people-carrying drones will take millions of dollars and several years-and that's once agencies such as the U.S. Federal Aviation Administration decide what the standards should be. No such standards currently exist. "Nothing like that has been certified," said John Hansman, an aeronautics professor at the Massachusetts Institute of Technology who has studied the issue. "People at the FAA are worrying about how to do it, but nobody knows how to do it yet." One of the key underpinnings to the airline industry's unprecedented string of years without fatalities in the U.S. is the rigorous process of certifying aircraft. But it is these high standards that will also make it tough to approve the revolutionary new designs for robotic vehicles. "I think it will happen faster than any of us understand." U.S. and equivalent regulations around the world hold that manufacturers must demonstrate that catastrophic failures are so remote that they won't happen in a billion flights. That means wings won't fall off or the autopilot won't suddenly veer into the ground during a model's entire lifespan. Unless Congress or the FAA eases the standards for autonomous vehicles, Boeing and other manufacturers would have to prove to regulators that their computerized sensors and robotic guidance systems are equally reliable. "It's extremely costly to certify new aircraft, even when you're certifying it for a well-established use and with well-established rules," said Steve Wallace, a former FAA official who oversaw accident investigations and also worked in the agency's certification branch. "Here we're trying to open up a whole new use where there aren't any rules. That's an enormous task. "Muilenburg, 54, is aerospace engineer by training and enjoys the challenge of thinking through the sense-and-avoid systems and other technologies to prevent airborne mayhem. "We are making investments there," he said. "The autonomous car ecosystem is making investments there." Given Boeing's traditional retirement age of 65, he will more than likely be around to deal with the aftermath of product strategy plotted today-from an all-new jetliner family nicknamed the '797' by analysts to the autonomous vehicles he expects to reach the market in large numbers by the mid-2020s. Since Muilenburg took over as CEO in mid-2015, Boeing has expanded its line-up of futuristic planes and created a venture capital arm called HorizonX to foster promising technologies such as hybrid-electric propulsion. The largest U.S. industrial company is also investing in digital design tools and three-dimensional printers that can quickly turn aircraft concepts into working models. Take the battery-powered flying platform that Boeing unveiled in January, a prototype cargo drone with the muscle to haul 500-pound loads over 20 miles. It was developed in just three months by the planemaker's Phantomworks unit, but the multi-copter vehicle could evolve into the airborne equivalent of a pick-up truck. One of HorizonX's investments is in a Pittsburgh company called Near Earth Autonomy. The spinoff from Carnegie Mellon University's Robotics Institute has developed sensing technology that makes driverless aircraft a lot smarter. A company YouTube video shows a drone zipping over a country lane dodging trees and adjusting its course, on its own, without the aid of a global positioning system. The possibilities of using the technology to improve safety are intriguing, said Steve Nordlund, a Boeing vice president in charge of HorizonX. "We'll leverage their technology potentially inside the company," he said. "It's early but that's plan."